Well the November food challenge of no groceries for a month is officially over. This really has been an eye opener for me and my spending habits when it comes to food. Here is how I did this last week of the challenge. I did have to buy groceries this past week, but let me tell you why. I put the turkey that my mom had purchased for our Thanksgiving feast in my fridge to thaw on Sunday of last week. On Tuesday I went to put it in a brine and realized that the turkey had been thawing and dripping blood into my crisper drawers. My veggies that I was going to use for the dressing had been marinating in turkey blood for at least a day. Yuck! I wasn't about to take any chances, so those veggies were thrown out, my fridge got a good cleaning, my turkey ended up in the brine, and I had to go and buy onions, carrots, and oranges that I used for our Thanksgiving meal. I also ended up buying two loaves of bread for the dressing. I had made bread, but I ran out of time and I got really nervous about having enough. My mom had extra celery so she gave me hers and I didn't have to buy that. I ended up spending less than $10.00 for what I had to replace. Our meals this week were sporadic and consisted of quite a few sandwiches, ham and pbj, until the day of the feast. Since then we have been eating leftovers. I was really hoping that I could have made it through the month and tell you that I spent nothing on groceries. What I can tell you is that I spent less than $100.00 on groceries this month and for that I am extremely proud! For groceries, we generally spend anywhere from $300.00 (on a slim month) to $500.00. Our freezer also looks much better. In fact I plan on taking inventory of what we have left and organizing it so I can access food better. Our pantry has less food in it, but it is still a mess. I do need to organize my pantry, but that will be a job for a cold snowy day. I did learn some things while going through this process. And I thought I would share what I learned with you. At the beginning of the month, take an inventory of what you have in your pantry and freezer. Be sure and write down what you have on hand. You might be surprised to find that you have multiples of an item. My favorite inventory worksheets can be found HERE. Just scroll down till you see Cleaning & Organizing and you will find both the pantry inventory and the freezer inventory worksheets that are free! 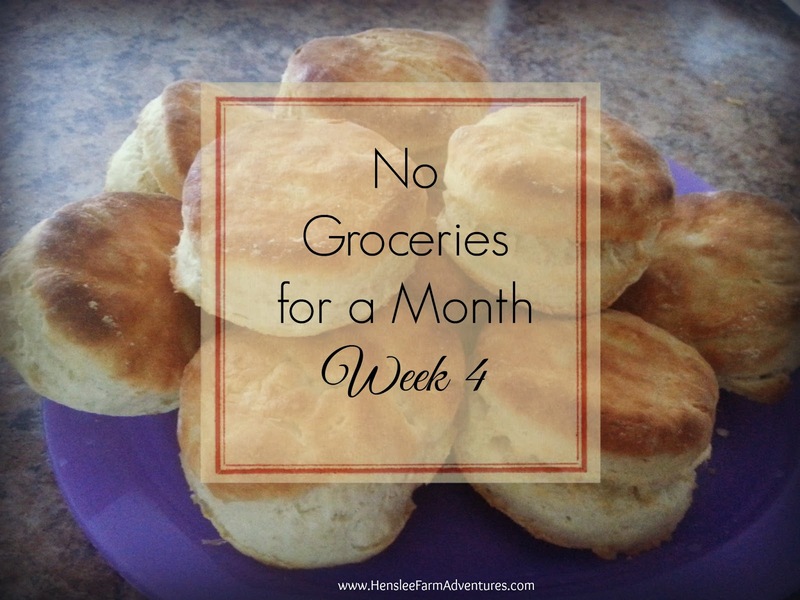 Once you have your inventory of your foods, then start planning your meals for the month. This is a great time to sit down with the family and let them help plan the meals. I know my kids have favorite meals that they always want me to make. As I write down the meals I make notes of what I have on hand and what I will need. I also make notes if it can be a slow cooker meal, or if it will take additional time to make (making it the perfect weekend meal). Cooking from scratch is a great way to save money, use up your stockpile of groceries AND eat healthy. I love to cook from scratch, but unfortunately I'm not always home to be able to. Some of my favorite things to cook (or bake) are bread, cookies, and soups. What I have found is that it doesn't take much extra time to make, you can control the ingredients that goes into the food, and it tastes so much better! It is okay if you make a mistake. It is okay if you have to go and buy groceries, when you didn't plan on it. I experienced some stress because I wanted to be really successful in this challenge. At first I thought that if I bought groceries, then I had failed. That is not the case at all. The savings my family experienced is enough for me to call this challenge a success. Plus I have the bonus of using food that might have ended up being thrown out instead of eaten. So now I have learned not to be so hard on myself. We all experience setbacks and we can always turn those setbacks into something positive. So how did you guys do? Did you make it through the month? If any of you tried this challenge let me know in the comments below how your month ended.